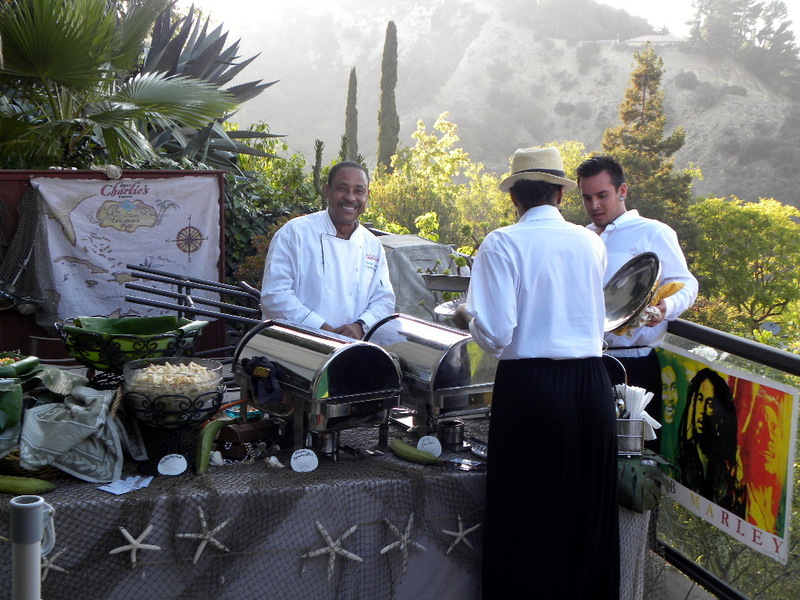 High above the sweeping San Fernando Valley in the hills of Sherman Oaks was a 65th Caribbean inspired birthday party on August 10th. 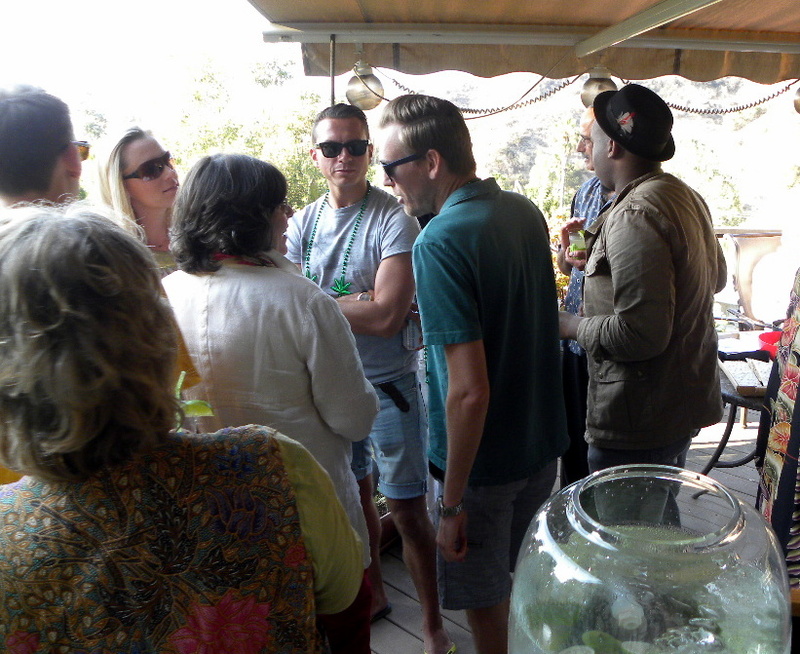 40 plus people attended and sipped frozen rum drinks, Margaritas, and Red Stripe beer. Nesta provided the steel drum entertainment, and a quartet of talented lady singers made a surprise appearance. Shaken Not Stirred of Van Nuys provided the mixologist – me. I worked with closely with the host making the drink menu and shopping list. She wanted one specialty drink that I had never made before: the Royal Caribbean Lava Flow. I was reluctant to do the drink, because it seemed like it had the potential to be messy and time consuming. I’m glad I did do it, because it was a hit and looked fantastic. You soak frozen strawberries in Myer’s Rum, then pour them into the bottom of a glass, then you pour a blended mixture of ice, white rum, bananas, Malibu Rum, and coconut cream over the top, creating a layered, “lava flow” drink. Needless to say, I ran out of ingredients half way through the party. I have upcoming events booked in September, October, and November. The holiday season will come faster than we know, so now is a good time to start booking those holiday parties. 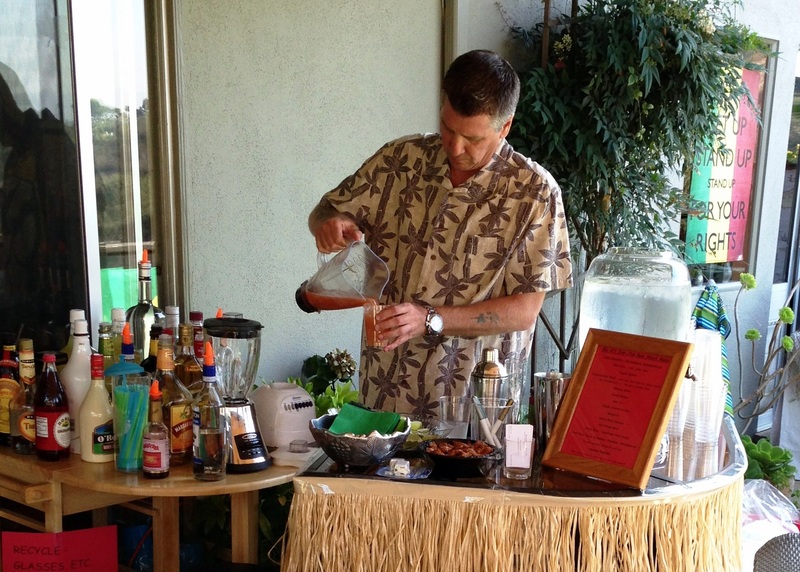 Shaken Not Stirred provides bartending services for weddings, birthday parties, reunions, openings, corporate events, and just plain old parties. Call me today and we can start planning; I can help you make a drink menu specific to your event, and a shopping list of everything you will need. Let me help you host an unforgettable occasion! Many thanks for your great service as our 65th birthday party bartender on August 10. You were everything we hoped for, & more, & such a gentleman to boot. We would have no hesitation hiring you again or recommending you highly to others. One more comment: You did a beautiful job creating a new drink that I wanted & that you had concerns about. Wow, we actually ran out of some ingredients? A true sign of a winning drink.